"Eli's imaginary prince suddenly becomes real, bringing with him a world of fantasy Eli never expected, and a chance at love neither are prepared for." Eli has always felt like he didn't belong. One day, he discovers that the lake in the new city park is far from ordinary. An image of a prince and a medieval world reflects back at him, and it seems like he is the only one who can see it. Eli soon finds himself stuck with the demanding heir of Linshaster. A Prince From Another World has not been tagged yet. Help others find A Prince From Another World by tagging it! 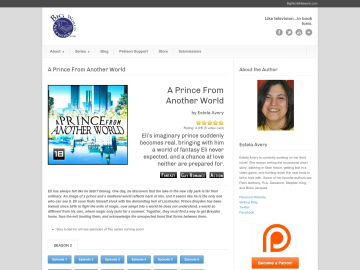 A Prince From Another World has not been reviewed yet. A Prince From Another World has not been recommended yet.